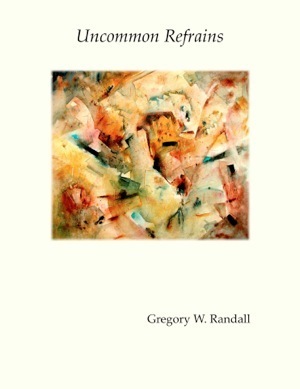 Gregory W. Randall was introduced to poetry in grade school by his grandmother who read to him Yeats, Frost and Sandburg out of her high school anthology. Ever since, poetry has been a part of his life. He majored in English and Latin at St.Olaf College and spent innumerable hours in the music library. Classical music by composers such as Chopin, Brahms and Fauré continue to inform both the structure and pacing of his poetry. Gregory W. Randall’s chapbook Double Happiness was selected by Mark Doty for the 5th Annual Camber Press Chapbook Award for 2009. His chapbook A Room in the Country was published by Pudding House Press in 2010. He received a Dorothy Sargent Rosenberg prize for 2008 and a 2009 Pushcart Prize nomination. His poetry appears in numerous journals and periodicals. You can visit him on his website gregorywrandall.wordpress.com. Greg and his wife Toni, a fellow poet, live in Santa Rosa, CA where they own a financial planning practice and host the Londonberry Salon and the Londonberry Salon EAST. I first became aware of Greg through his wife Toni Wilkes, whose poetry appeared in all three issues of the first year of Touch: The Journal of Healing. Toni encouraged Greg to submit to us and after a time he did. We found Greg's poetry so uniquely eloquent and so profound, we asked him for more, and after reading his collection, we asked to feature his work as our Editor's Choice in the third issue of our journal. Two of Greg's poems were selected for Strong Voices - a Year of Touch: The Journal of Healing. The collection of poems included in this book expand and expound on the theme of family touched upon by those featured in the journal. They provide us with a deeper look into the lives of a family connected by illness and marriage. These poems convey with stark realism and exquisite imagery the dedication of a kind, courageous, and determined man whose relationships within a family are of and by choice. With true skill and craft, Greg draws us into his story by bringing together the details of one of life's most difficult scenarios with a clarity of emotion and thoughtfulness which is the hallmark of excellence in writing. I am drawn to these poems through his adept use of language and poetic devices, yet one cannot help but appreciate them for their beauty. Without realizing it, one can easily overlook his use of allegory and allusion. Without noticing them, we can appreciate simile and symbolism long before we become aware of their use. We can be transported into his world unknowingly through imagery and miss the metaphor in his message on a conscious level, but in the end, we cannot help but be moved and affected by his words. These are poems of disruption, love and connecting: a step-daughter in medical crisis; a granddaughter dappling the days to discover her "me-ness"; a mother/wife overwhelmed, and the poet stepping in to take his place in these certain and uncertain lives. How does one handle the great vulnerabilities? As well as we can. Randall gives you the sweep of his heart, his pain, and his steady attention as he gathers all these women, and you, into his embrace. These poems speak to such times as we all have or may face. They are beautifully written, powerful, and expanding. Gregory W. Randall is a poet with the rare gift of being able to fuse intellect with passion and vulnerability. These smart, tender, harrowing poems explore what happens within an extended family when a young married daughter, herself a mother of a young daughter, suffers a major stroke. You will cherish this book for its compassionate concern and for its many moments of transcendence. In Uncommon Refrains, Greg Randall traces a generational triad of domestic devotions: to a wife, to the wife's seriously ill adult daughter, and to that daughter's vivid young daughter. Amid facts of bodily wreckage and the unrelenting pressure of an uncertain future, the poet writes, "I grab your sleeve, hold / onto you tenuous as a kite." These poems embody "refrain" both in their lush musicality and by means of their restraint, unfolding a tensile delicacy, the sensory terrain of language itself.